Usually these portraits of a composer passing on divinely-inspired music to a scribe featured Pope Gregory the Great (after whom Gregorian chant is misnamed). 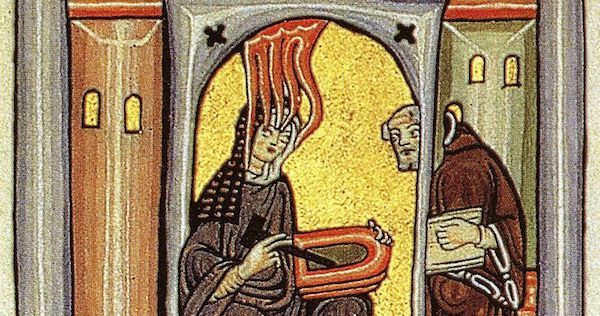 Having a woman in that chair shows the extraordinary place Hildegard occupied during her lifetime. From the Scivias manuscript (1151). Think of a revolutionary moment in music history. Beethoven’s 9th? The Rite of Spring? Schoenberg’s tone row? Piffle. The real revolution was the first time one pitch was sung at the same time as another — the first harmony. There’s no way to know when that first happened, but we do know that early Jewish and Christian music was monophonic (one note at a time). The purity of a single tone was thought to be most appropriate for worship. Harmony introduces ratios of vibration, which introduces the dissonance spectrum, and Beelzebob’s your uncle. Composers started easing into harmony in the 10th and 11th centuries, first putting simple drones under chant melodies, then doubling the chant melody at the fourth or fifth, then stretching the chant into long notes with florid melody above. Certain intervals were banned by the church, but by the 13th century all hell breaks loose, and the full chordal harmony of the Renaissance isn’t far behind. The drone in “O virtus” below is on the tonic and dominant (E and B), and the E Phrygian melody includes an F, which clashes yummily with that E drone as it passes by. You can hear that at 0:14, 0:36, and 0:52, etc. That delicious, spooky little Phrygian cloud passing over the harmony is Hildegard’s special sauce, the dangerous note that makes it otherworldly.